PEEPSHOW 2011: It’s Complicated Feb 26th! Tickets will be available starting February 1st at the following locations: Cafe Taza, Sweetness 7, Talking Leaves, and online at www.squeaky.org. Tickets are $15 in advance / $20 ($15 for students with a valid ID) at the door, 18+. Hosted in Phoenix’s Bragg’s Pie Factory, Dangerous and Hard to See is a juried group exhibition featuring work of all media, from artists throughout the United States. Curated by Ryan Peter Miller, work in the exhibition questions traditional modes of presentation and function. Through videos, conceptual work, installations, fibers, sculpture and more, participating artists challenge the tropes of gallery exhibition. The exhibition’s aim is to undermine the platitudes of display while acknowledging the system through which commercial art is exhibited.Artists in the exhibition include William Andrews, Janet Braun-Reinitz, Peter Bugg, Robert Derr, Peter Emerick, Gratuitous Art Productions, Dana Hemenway, Elizabeth Morisette, Aaron Nicholson, Laura Pawson, Evan Pomerantz, Marco Rosichelli, Thomas Sturgill, Dan Szymanowski, Matthew Wilson, and Katherine Worel. GAF AND CINEGRAPHIC @ CHICAGO INTERNATIONAL FILM FEST! A terrific collab with our buddy CineGraphic (aka Eric Krasner) will be screening in the one minute competition at The Chicago International Film Fest! Our interpretation of “The Human Condition” will be showing, Sunday 10/10 at 12pm at AMC River East. 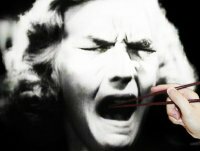 With “The Human Condition”, we are bringing back a tradition, begun at the 4th Chicago International Film Festival in 1968, of presenting a unique competition. We challenge filmmakers from around the world to use the medium of film to address a particular question, concept, or issue in one minute. This year, we turn to the creative filmmakers of the word to explore “The Human Condition”. Filmmakers of all ages are invited to conceive, design, and produce an original 60 second film that examines who and what we are. The human condition – is it describable? What causes people to start a war? Grow a flower? Abide poverty? Create Art? Advance technology? Pollute the environment? Seek knowledge? Cure illness? Is there a difference between cause and effect, symptom and disease? What is our place in the world? What makes us who we are? Check out Horsepower at 2pm Saturday, September 25th in the Collision Course section! EPIC EMERGENCY_V1: THE EPIC-EST EPIC TO EVER EPIC AN EPIC. SEPTEMBER 4TH AT PERFORMANCY FORUM. Gratuitous Art FilmsJoin us Saturday, September 4th at 8pm as we explore intersections in contemporary performance practices, facilitate informal peer feedback on works in progress, and work to create a community of conscious, post-product-based working artists. 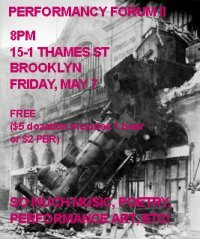 BYOB or $2 PBR (proceeds to the arts and activism collective and performance space, Surreal Estate). This PERFORMANCY FORUM, the fifth curated by the Panoply Performance Laboratory’s Esther Neff and Brian McCorkle at Surreal Estate, includes hybrid performance art and video works. 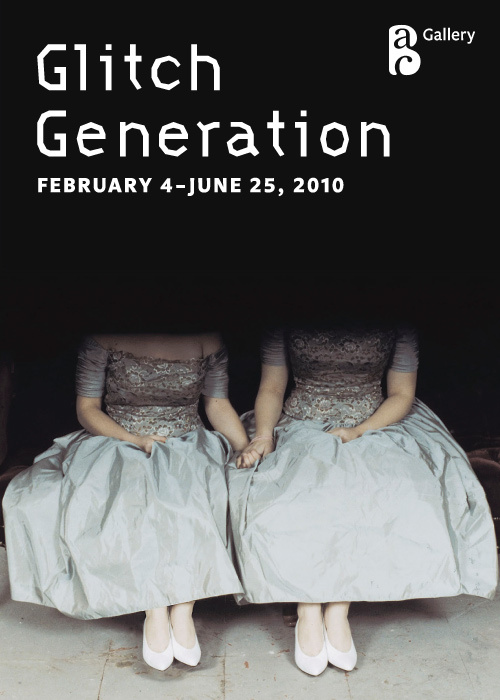 Check out the GAF work at Videoholica 2010! A Light at the End of the Tunnel is an epic video art trilogy about the human condition which includes seminal works by 30 international emerging artists.The concept of life, death and rebirth has followed humanity through t he ages as the self and the collective whole passes through time, creating a relative chain of events that could be called the history of universal human experience. It’s through all of these varying hhistories, and a perpetual creative avant-garde that continue to seek a move vivid understanding of the interconnectedness of life. Our great quest to solve the questions of our age could be exemplified by one of humankind’s greatest achievements at CERN Labs, Large Hadron Collider in Geneva, the worlds largest machine. As the scientists at CERN continue to probe the most fufundamental questions of life and the origins of the universe, we seek artists that are asking similar big questions in their creative practice and use their creativity to reveal the world in new and unexpected ways. Why are we here? What does it all mean? How is it all relative to art in the 21st century? GAF AT DIGIT IN NARROWSBURG, NY. Check out The Red Shrimp at the 2010 Digit Fest Sponsored by the Delaware Valley Arts Council! The seventh annual DIGIT digital media exposition kicks off Friday, June 18 from 7–9 p.m. with a double opening reception of Conrad Gleber’s video installation “Four Walls / Four Seasons” at Alliance Gallery and “Alternate Reality” video screenings and installations in Loft Gallery at 37 Main Street in Narrowsburg, NY. Both exhibitions will remain on display through July 10. DIGIT is proud to host several visiting artists and their innovative works, including Thomas Zummo’s digital art displays revealing brand new technologies such as augmented reality and laser graffiti; Ivan Martinez’s “Running Man” projections from a flatbed truck on Main Street; Mat Rappaport’s video and Morse code over the Delaware River titled “currents,” Owen Mundy’s projected installation “The Consequence of Scale,” and “Beloved River: The Portal Form” by DIGit founder Patrick Carullo. Narrowsburg Roasters will once again host “Java with the Geniuses” an open and free discussion for anyone to ask technical questions—from how to download a picture to how to start a website—on Saturday, June 19 from 10 a.m. to 12 noon. Next door at the Arts Center, a series of workshops will explore topics including Conrad Gleber’s “Using Microsoft’s Photosynth” and Ron Littke’s “Videotoons” animation workshops for kids 3–12 years old. The “Quick and Gritty” video slam returns, inviting artists of all skill levels to make their own 3-minute digital movie. In what has become a festival favorite event, the short videos are screened on Sunday, June 20 at 12 p.m, at “video slam” at the Tusten Theatre. A jury of judges will award a $500 grand prize. Sponsored by the Delaware Valley Arts Alliance, DIGIT encourages creative and technical excellence and experimentation among individual artists and small groups working with digital tools. The event is funded in part by a grant from the Electronic Media and Film Program of the New York State Council on the Arts. For more information, call (845) 252-7576. 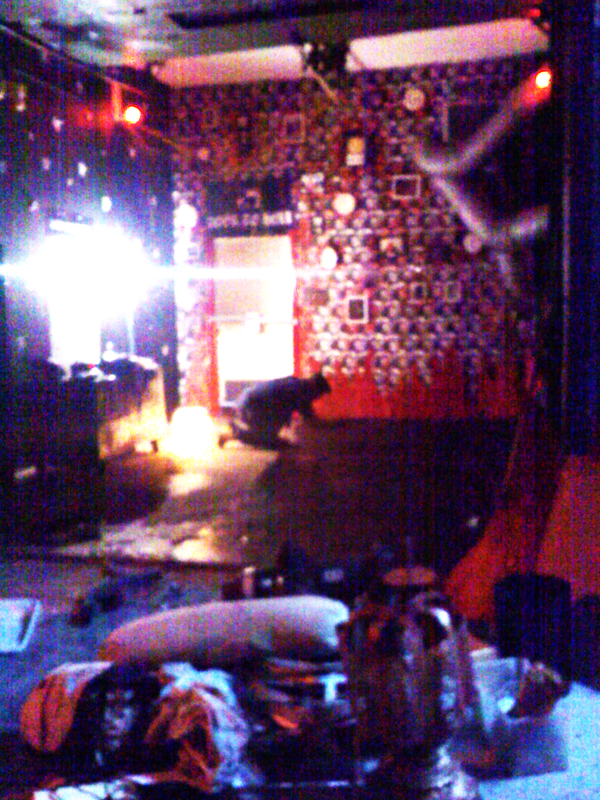 Check out our films at ARTS IN BUSHWICK: ISLAND ARTspace. They will be sprinkled in like so much pepper amongst the music and images. Check out Thor’s Lullaby at 6X6 media! 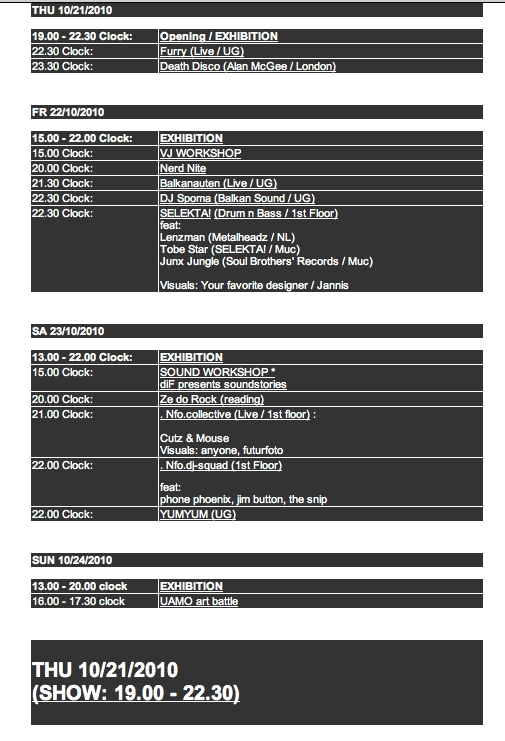 art show and a film festival, first Wednesday of the month at Ciné Lab. HILARIOUS interview with the curator, Paul Thomas, of the recent “LIGHT” show we participated in at 6×6 Media Events in Athens, GA! Surreal Estate is a live/work arts and activism collective located at 15 Thames between Morgan and Bogart in East Williamsburg. Simply take the L to Morgan. 1 free beer with a donation of $5 or $2 beers with no donation. 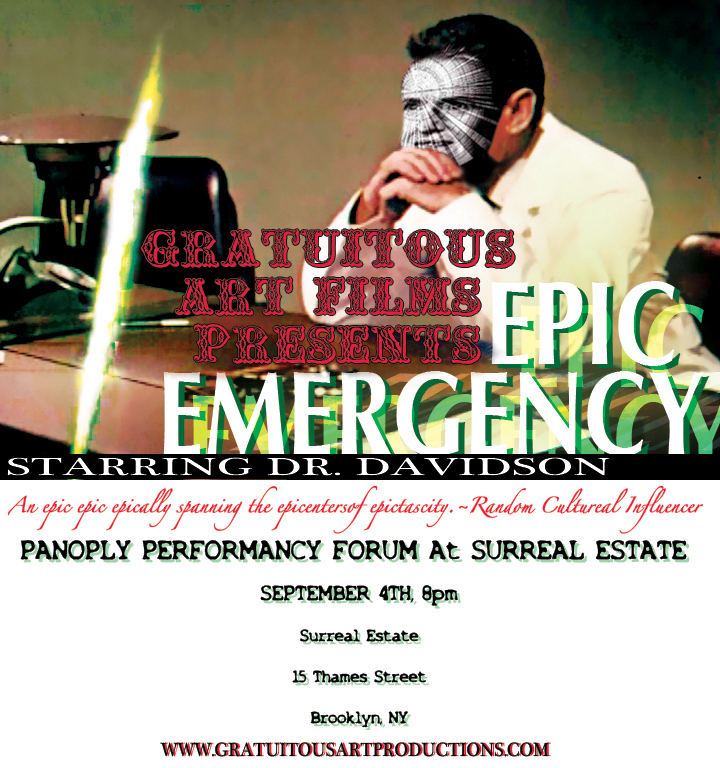 All proceeds go towards renovation of the Surreal Estate performance space(s). 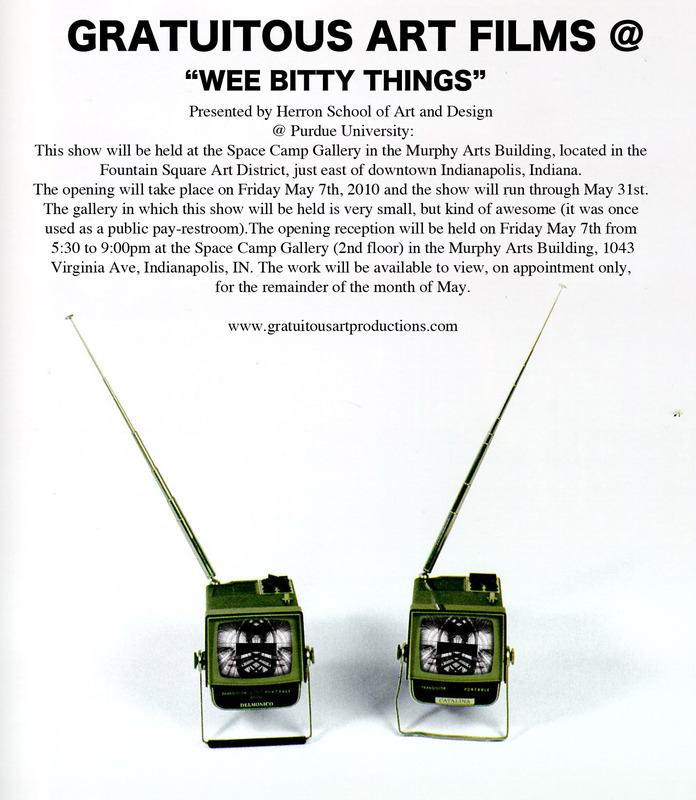 A show dedicated to tiny works, no larger than 6×6″. 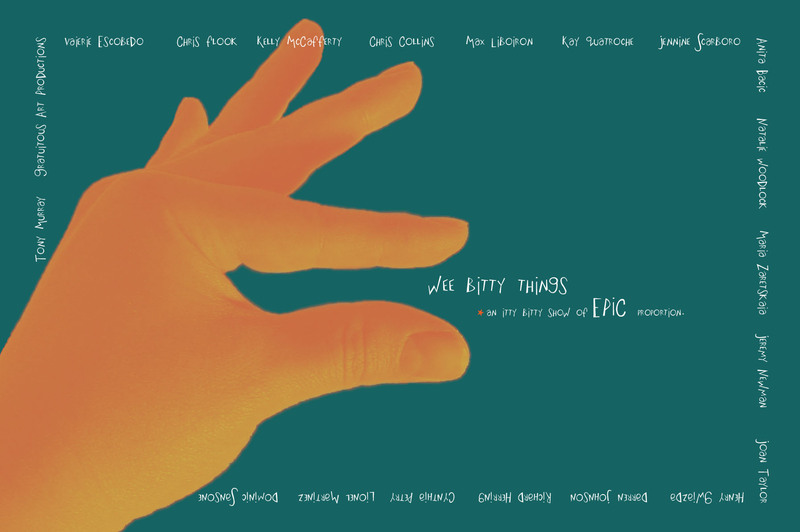 Gratuitous Art Films, Derek Brooks, Anne Peterson, Kelly Griffin, Kristen Gann, Mike Griffin, Matt Bradley, Barry Gunning, Nick Rogers, Rebecca Jones, & Mike Anderson$5.00 for current ACAC members; $7.00 for non-membersDoors open 7:00 pmFree fresh-popped popcorn! The Arkansas Community Arts Cooperative’s space is located at 900 S. Rodney Parham Rd. in Little Rock, Arkansas, just east of the entrance to Kanis Park. GRATUITOUS ART FILMS AT JCIA GALLERY. OPENING RECEPTION FRIDAY DEC 11, 6pm. HOPE TO SEE YOU THERE! A fiscally responsible evening filled with gratuity, films and popcorn. Gratuitous amounts of beer will be available for purchase.